Cheap and cheerful Chinese noodles. 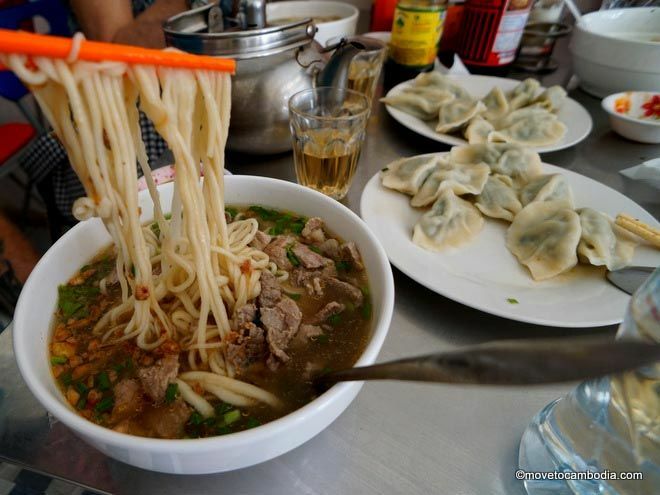 Located on Road 2 between Pub Street and Psar Naat, Lan Chov Khorko Miteanh — or Chinese Noodle Dumpling as it’s more commonly called — is a great low-cost noodle restaurant. The menu includes a number of delicious stir-fried and soup dishes made with their own hand-pulled noodles, as well as steamed and fried dumplings. Most dishes cost less than $2 and come with free jasmine tea. Portions are huge and watching the ‘Noodle Man’ prepare dishes at the front of the shop is one of the highlights! The best place to get a traditional Cambodian breakfast in Battambang is an informal stall set just back from the road serving Khmer noodle soup, known as kuy tiev. You’ll find this gem on Road 207 towards the President Hotel, just past Dewey University. It would be hard to find if it wasn’t so popular — there’s usually a sea of motos parked around the gateway there to slurp up the tasty vegetable, noodle, and pork broth soup. A bowl is only $0.75 but be sure to get there early as they close up mid-morning. 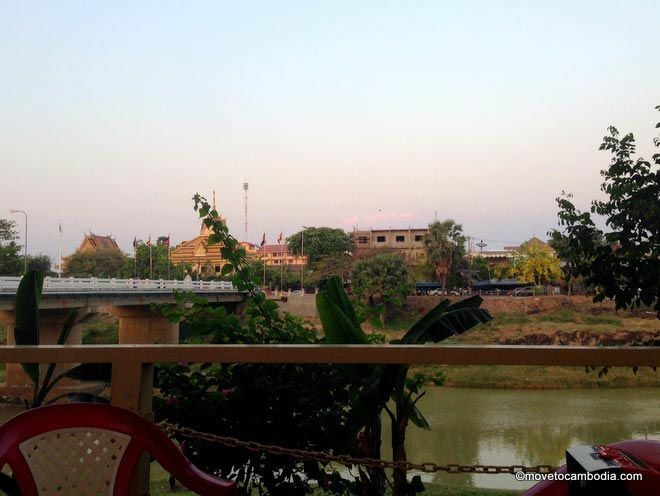 Cheap eats and excellent river views at The River in Battambang. 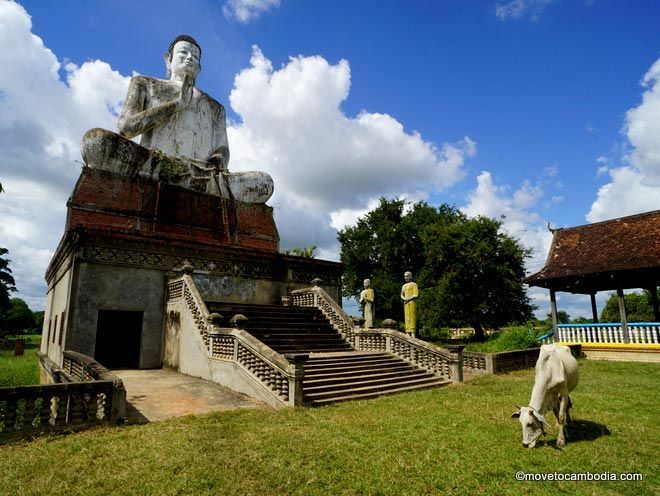 Scenically located on the banks of the Sangker, The River has an extensive and inexpensive menu of Khmer and Western dishes for between $2 and $4. The restaurant is open for breakfast, lunch and dinner, although sunset is a particularly nice time to enjoy the view, and if you want a sundowner, draft beers are only $0.50! Open daily, 6:30 a.m. to 10:30 p.m.
A little out of the way beside Wat Sangker, is Maryan Pizza House. Although their pizza is not so low-cost, the Khmer dishes are delicious and generally come in for less than $2.50. It’s also a nice place to dine with friends as there are a number of small booths in which you can eat. Open daily, 7 a.m. to 9 p.m. There is an ongoing debate about whether this dish originated in Cambodia or Vietnam, but if you’re in Cambodia it’s best to stick to that side! The traditional bean sprout, vegetable and meat filled egg crepe is available at a multitude of restaurants along road 159D (towards the railway line) for just 3,000 riel ($0.75). There are several restaurants serving banh chao all in traditional wooden houses overlooking the river with great views and also offering a unique cultural experience. The one below, in a green building, is my favorite. Looking for more ideas? 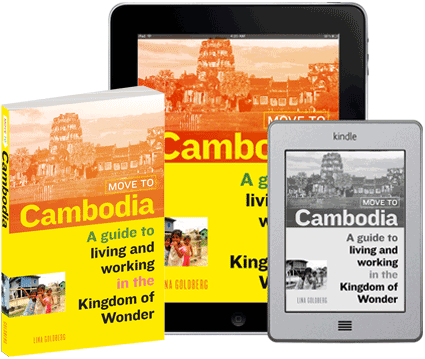 Check out our dining guide to Battambang. This entry was posted in Battambang and tagged Khmer cuisine, Chinese Noodle Restaurant, The River Battambang, Mariyan Pizza House. Bookmark the permalink. can we get the address with maps location and contact number.